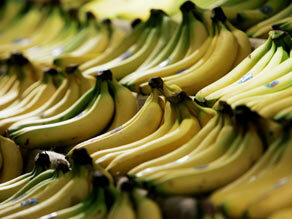 Known for being nutritious, sweet, cheap and readily available, bananas are definitely popular. But did you know that in five to ten years banana experts say this tasty fruit could disappear? Well, not all bananas of course, but the variety we eat called the Cavendish. A malady named Panama Disease, threatens to wipe this variety from fruit stands and cereal bowls around the world. One problem is that every Cavendish banana we buy at the grocery store is a clone from the first one found in Southeast Asia and brought to the Americas in the early 20th century. It's a seedless banana that can only grow from another of its kind, and even though it was once resistant to Panama Disease, a fungus that affects the leaves, it mutated over time leaving the Cavendish vulnerable to the new strain. Our grandparents ate a different kind of banana called Gros Michel, one that became extinct due to Panama Disease. The Cavendish replaced it, and even though many people found the Gros Michel a superior banana in taste and texture, this new variety quickly became the most popular fruit in the United States, surpassing apples. The fungus that is currently affecting Cavendish crops in Asia could eventually hit banana crops in Central and South America. In the meantime, researchers are busy trying to find a replacement for the Cavendish because they say it's only a matter of time before the world's perfect food is gone for good. If the world's gone bananas, then the banana's world's gone fungus! What can be done to stop/eradicate this fungus? Can we genetically reengineer plants to become more resistant to it? The bananas are dissappearing, the bees are dissappearing, the ocean has floating garbage islands, thousand miles wide. This world needs solutions NOW. This is rather big news. If an important part of my weekly diet were to become extinct, that's extremely big news. Fascinating to realise how engineered and unnatural our bananas are. Heard this reported on NPR. Worst case scenario, shipping will have to be revamped for a new variety of banana, as is was when Gros Michel went extinct. Those bananas could just be thrown in the hold of the ship, rather than having to be boxed like the Cavendish are. This will drive the prices higher. There are 1000's of varieties of banana. If you've ever been to Central or South America, or the Caribbean, you've probably tasted how good bananas can be. Hmmm. sounds like the Cavendish needs a vaccine. Well, researchers shouldn't have a hard time introducing the Panama Disease Fungus to the South East Asian bananna, so i wouldn't worry so much about extinction or replacement. If the jobs done right. I don't understand some of these comments. First of all, the banana tree clones mentioned here are just cuttings from other trees, which is necessary to produce any seedless fruit. That doesn't seem so "engineeered and unnatural" to me - cultivation from plant cuttings is an old art. If your fruit doesn't have seeds in it, it likely didn't grow from a seed either. Second, I don't understand the comment about the Cavendish banana tree needing a vaccine. Panama Disease is caused by a fungus (Fusarium oxysporum), not a virus. Cavendish will be replaced by another species of banana, as Gros Michel was so I am not worried. Hope the next generation is called the Obama banana. Sorry, just some way out idle speculation. Gostei muito faz mais posts deste modo !! Sou o Nuno,Adoro livros , dedico imenso do meu tempo a melhorar o meu espaço online costumo também editar legendas para imenos fóruns,talvez até já viram alguma série com legendas elaboradas por min! E por hoje é tudo, pois eu trabalho por turnos e tenho de ir dormir um bocado. Olá!, o meu nome é Darth_Vader e adorei imenso do teu blogue! Muito linda sim senhora! Adequa-se imenso em tudo aquilo que aqui li.Hoje por vezes há muito para falar nos blogues!Nada nada mais intrigante do que por a nossa escrita espalhada pelo mundo!E por tudo isso escrevi este comentário! DIY on "this old space shuttle"